The Lutheran Bible Institute (LBI) held an all-class reunion July 18 at Calvary Lutheran Church in Golden Valley, Minnesota. 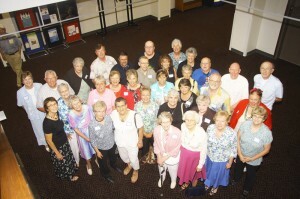 Although several classes were represented, many participants were from the Class of 1965. For more information about the history of LBI, see “Is there room for a Bible school in the Lutheran Church?,” Metro Lutheran, July 2010, page 18. And find out more about the Norwegian Lutheran connection by reading “LBI revival empowered the Norwegian church, too,” Metro Lutheran, August 2010, page 5. The Association Free Lutheran Bible School also traces a similar lineage; more about that in future postings.